Briscoe inquest: Alcohol’s ‘flotsam and jetsam’ forever a burden on police? When Kwementyaye Briscoe died in the Alice Springs police watch house in January it was a tragic event for him, his family and the community. The coronial enquiry heard evidence that police procedure surrounding the death was inadequate and more appropriate action by several officers may have prevented the death of the extremely drunk man. Counsel for the Northern Territory Police Association (NTPA) Lex Silvester addressed the enquiry and acknowledged the severity of the events: “That Kumanji’s death occurred in the circumstances then prevailing is a matter for profound regret. The loss of a child, brother, sister, relative or friend causes terrible grief the extent of which can only ever be known to those closest. However, much of Mr Silvester’s address to the Coroner, in its content and significance to the community, went well beyond the events of that night. It painted a horrendous picture of the trauma, mayhem and tragedy alcohol is causing, and the intolerable burden that is placed on the police, every day. It went further to urge a sweeping independent review of the take-away liquor trade in Alice Springs. The Alice Springs News Online has been an important forum of discussion about better management and control of the use of alcohol. It is in this spirit that we publish excerpts from Mr Silvester’s submission, as follows. That police were so engaged on this particular evening was not an isolated occurrence. Such work is repeated every day, very many times over, in every town and city of the Northern Territory, every day of the year. It is a large part of policing. It consumes enormous cost and resources. Probationary Constable Gray described conditions in the Alice Springs watchouse in the summer as “extremely difficult” because of the heat, the ambient smell, the odour of urine and feces, and the screaming and shouting of persons who are very drunk. It is of such mind-numbing, de-sensitising and soul-destroying work as to be heroic. The community demands that some-one do this work, and it is Police who answer this call. But that it is necessary at all is because of the effects of alcohol, violence and the poverty and generational disadvantage on people, mainly Aboriginal. It has been going on for a long time. It is a stain on the character of the whole community of the Northern Territory. It is seen at every level of the community and, dare we say it, government, as a problem incapable of solution, and it might be said that the broader Territory community has turned off, shut it out, wishing it would go away. It is in particular, a problem at the very heart of indigenous disadvantage. It is a problem so deeply entrenched that it leaves a large proportion of our community locked permanently into a spiral of hopelessness and the rest of the community, which remains largely well-intentioned, overcome with a sense of futility and helplessness. A reality is that there are no panacea of universally acceptable or practical application available that can produce short-term relief from this situation. On the best view one can take of it, Police will be involved in this way for generations to come. There are no quick fixes and any potential solutions will require the commitment of police in a major way, virtually indefinitely. But the NTPA submits that a start has to be made and the opportunity is imminent. It is also an opportunity for the death of Kumanji Briscoe to be a trigger for meaningful change. It is, Your Honour, truly a case of carpe diem – seize the day. By these submissions, the NTPA asks for findings which recognize a simple truth. Part 7, Division 4 of the Police Administration Act constitutes police as instruments for the delivery of social policy. Policy which results in the state charging its agents, police, to pick up drunks, take them to the Police watch house or sobering-up facilities, care for them while under their control, and be accountable for their actions while so doing, day after day, night after night, week after week, 365 days per year – with never ever any let up – and with matters as they presently stand, no foreseeable prospects for any let-up in the future. But even this analysis alone, does not articulate the far broader sweep of Police involvement in the maelstrom of alcohol-induced indigenous behavior and disadvantage that was articulated in the evidence in this inquiry. If this can be accepted, then also can it be accepted that the answer does not only lie in policing, but in changing social policy. Changes in social policy not just to protect police from the horrors they daily face, but to ameliorate, even over time prevent, the risk of death by alcohol to those persons most at risk. People like 32 year old, Kumanji Briscoe. In the present case social policy purports to deal with the detrimental effects of excessive alcohol consumption, to life and health, in two ways. First by very generous, indiscriminate and lightly regulated arrangements permitting the distribution, sale, availability and consumption of alcohol, without more than token regard to known risks and effects. Second by institutional arrangements charging police with the task, and requiring the public to bear the cost, of picking up and protecting what amount to society’s flotsam and jetsam, the weakest and most vulnerable in our community; who are above all the product of misguided and failed alcohol policy which continues not to squarely and unambiguously address alcohol-caused or related harm. Yet, on 5 January 2012, pursuant to social policy, two groups of already drunk aboriginal youths were each able, around 8.00 pm or later, to acquire, apparently through an intermediary not on the banned drinkers register, a 30 can pack of VB and one 700mm bottle of Bundaberg Rum, from a licensed grocery store [Aboriginal owned – ED] in Flynn Drive, Alice Springs. This group or groups of Aboriginal youths had each consumed at least one 30 pack of VB cans in the afternoon and intended to drink the additional beer and then the rum, on into the evening. The drinking would be unchecked by any level of reason. Just drink till it’s all gone. There is no reason to think any of them would get other than legless. Society, including the store licensee, meanwhile could lie secure in the expectation that police would, at some stage, in the public interest, tip out their alcohol and take them into protective custody to allow them to sleep it off and sober up, with appropriate care and medical attention as required, before release, sometimes with charges for criminal or regulatory offences. But, release to what? To do it again, when next money and circumstances permitted. A particular symptom of disadvantage is the amount of money, presumably sourced mainly from that which replaced CDEP, and other welfare payments, which must be being spent on alcohol. No doubt figures are available, but what should strike the Coroner as truly astounding is Commander Murphy’s evidence, that in the course of their normal patrol duties, in the period 1 July 2010 to 31 March 2011, and the comparable period ending 31 March 2012, Police tipped out 9,204 and 8,410 litres of alcoholic beverages, respectively. This is alcohol taken from drinkers unlawfully in possession or, for their own safety, in Alice Springs. What this confirms is a divide in which social policy accepts that alcohol is at the heart of indigenous disadvantage and that that disadvantage is best addressed by having Police clean up the daily mess – or one might say, slide it under a carpet daily and nightly swept by Police. At the juncture of this divide is where social policy on alcohol and indigenous disadvantage in the Northern Territory currently collides, and at its epicentre is where Kumanji Briscoe died. On 8 January 2012, two days after Kumanji’s death, Vince Kelly, [NTPA president] and a serving police officer, wrote a letter to [media]. “It may be beyond the scope of a single coronial enquiry, however, perhaps some of the questions that the Coroner and we should consider extend beyond this individual tragedy. • What did Mr Briscoe’s family and community do to assist their countrymen, and others like him, to deal with the scourge of his own alcoholism? • Why was this young man’s health so poor that he has died at such a young age? • How do we help in a meaningful way four generations of Aboriginal people lost to themselves, their families, their culture, their community, and their country? So poor in fact that, having consumed beer all afternoon to the point of being very drunk, then in a space of a few minutes, just before arrival at the Police Watchouse, having consumed at least 350ml of Bundaberg Rum, as Dr Sinton, NT Forensic Pathologist opined, his chronic heart disease rendered him incapable of breathing properly when he lapsed into an alcohol-induced stupor. • Why after over 20 years since the conclusion of the Royal Commission into Aboriginal Deaths in Custody are Aboriginal people, particularly Aboriginal men, still over represented in Northern Territory and Australian gaols? • Why … have we been unable to break the cycle of welfare dependence and despair that afflicts so many Aboriginal people and leads many into police custody? • Why does the community, including a large portion of the Aboriginal community, consider it appropriate for alcoholics to be placed into police custody? Why is there no real alternative? • Why do some Aboriginal people, particularly some Aboriginal men, display such violent behaviour toward their own countrymen – women, children and men? • Why do people living in these communities seemingly accept such appalling behaviour as the norm? • Why do we accept that many Aboriginal women, children, and men are the victims of ongoing domestic and personal violence? • Why after the massive increase in resources provided as part of the NT Intervention has there been so little real improvement in many Aboriginal people’s lives? • Why do we accept that many Aboriginal children do not attend school, particularly in remote and rural Australia? • Why do we accept that many Aboriginal children who attend school emerge without basic literacy skills? • Why do we accept that teenage pregnancy in the Aboriginal population is commonplace – teenage parents who do not have the life skills to care for themselves? • Why do we accept that many young Aboriginal people are unemployed? • Why do we accept the poor health which exists in many Aboriginal Communities? • In short why do we accept that many Aboriginal people live in a cycle of grinding poverty suffering a lack of prospects, a lack of housing, a lack of health care, a lack of education, a lack of meaningful work – a lack of hope? And to Mr Kelly’s eloquent words, another question may be added, that is: Why are so many and an increasing number of Aboriginal children being born with foetal alcohol syndrome – a time-bomb ticking with the Australian community destined to shoulder the burden of the ultimate disruption and cost. A review by a completely independent body (not the Northern Territory Licensing Commission, or anyone associated with vested interests) of activities and trading patterns of take-away liquor outlets in Alice Springs, with particular reference to predatory practices and to identify store licensees for which alcohol comprises more than 15% of turnover, and in particular whether alcohol should be sold for takeaway from large supermarket chains such as Coles and Woolworths, at all. In this regard, consideration should be given to limiting the quantity of alcoholic beverages that may be sold from licensed takeaway premises, in both single, and related multiple retail transactions) to a threshold amount, and in any amount where it may be reasonably apparent to the licensee that the purchase is likely for resale, including transport for resale, in situations where ultimate consumption may be or may become unlawful. Those transactions could be become wholesale transactions, in which more prescription could be imposed. PHOTOS: Police CCTV images of Kwementyaye Briscoe in the watch house shortly before his death. 1. Although it is possible that there may be some people who are only able to drink alcohol legally “on licence”, and it is also possible that “in some circumstances this results in unsafe drinking practices in an effort to quickly consume any alcohol and evade detection by police”, the number of cases of this nature is likely to be insignificant compared to the number of people benefiting from the existence and enforcement of the Banned Drinkers Register and the associated measures. 2. Likewise a day on which take-away alcohol is not sold from retail outlets and pubs is likely to cause far more benefits than problems, and this has been clearly demonstrated in Tennant Creek, for several years after the measure was introduced in the mid-nineties, when the arrangement led to less serious alcohol-related problems occurring, as attested by the police and health staff who worked there at the time, and who argued very strongly for its retention. In fact such people would still be able to buy and drink alcohol every day, as the suggestion is simply for a day on which no sales of take-away alcohol are permitted, meaning bars and other licences to sell alcohol for purely on-premise consumption would still be allowed to operate as usual. As you say, the “entire issue is obviously a complex one with no easy solutions and unfortunately impacts on all residents of Alice Springs in some way”. However the facts are, for decades prior to the present more restrictive regulations, noisy and often violent drinking was occurring on town camps and other parts of town during the day, early evening and far into the night, even though the bottle-shops were opening at 10am, or in some cases even earlier. The idea that early opening hours for take-away alcohol will somehow improve domestic and civic amenity and safety is completely mistaken. There is much evidence to indicate that it would be more likely to lead to considerably greater levels of alcohol consumption, and consequent violence and other harms, than is presently occurring. The opportunities for buying and consuming it would increase, and the money left in the collective kitties of the heavy consumers of alcohol at opening times would be considerably greater than is currently the case. • Due to the current legislative restrictions there are a number of people who are unable to consume alcohol legally in Alice Springs without being on premise. Is it possible that in some circumstances this results in unsafe drinking practices in an effort to quickly consume any alcohol and evade detection by police? • There are a significant number of people who are so physically reliant on alcohol that withdrawal can have serious medical consequences and an alcohol free day may actually cause them harm, or create a situation where they resort to desperate measures to obtain alcohol. • The current alcohol sales times, both on and off premise, potentially create a situation where some consumers are at a peak intoxication level in the early evening, a time when children and other family members are around. Perhaps different opening / selling hours could create a situation where consumers have passed the peak intoxication stage by this time and could be “sleeping off” the effects. This entire issue is obviously a complex one with no easy solutions and unfortunately impacts on all residents of Alice Springs in some way. “Why does the community, including a large portion of the Aboriginal community, consider it appropriate for alcoholics to be placed into police custody”? Alcoholism (alcohol dependence) and alcohol abuse are two different forms of problem drinking. If there is a potential for violence the intoxicated person must be placed in police custody to protect members of the community regardless. Warren H Williams the singer from Hermannsburg said that his doctor told him to give up the grog or die. He stated that he was never an alcoholic and drank for the enjoyment. Privately, most problem drinkers would deny they are alcoholics. In court and usually at the insistence of a solicitor, it would be a case of “I am an alcoholic”. This in turn distorts the stats. Looking at the image of the Alice watch house in your story, I ask myself, is it fair that these young police officers have to face this sort of thing every shift? You can feel the tension and the ‘where is this going to go?’ in those officers who are looking on. What are they taking home besides their pay? We know the answer. The NT Police Association stuck up for its officers in its submission to the Briscoe Inquest. Another young Aboriginal man has been fatally stabbed in an over-night alcohol-related assault to the north of Alice and who, apart from family, cares? Who’s not yet numb to this slaughter? Who reckons it’s their choice whether they drink or not while the fallout spills over the fences of houses in and out of town? What does the alcohol industry think about it? How much more of this are we supposed to take? Where are those who are elected to act? I suggest that you try googling the following to see what they put on their web sites. Some of them will have information booths at the Show next weekend, with staff available to answer questions. But you are right – it would be useful to have an overview of the services and relevant stats. Perhaps a job for Steve Brown in his new role as watchdog of services? @1 Thank you Bob. It would be good to sometimes see statistics from such places – how many lives they turned around, how well they work, do they have enough funding and staff etc. I’ve been living in Alice for 24 years and not really aware of these options. To Anna Sheridan (Posted June 29, 2012 at 3:34 pm): Anna, there are several detox options in Alice, ranging from separate NGO residential facilities for adults and juveniles, to supported home detox. via a government AOD service, a service through the the prison, others through the Aboriginal health service, the hospital, and several other support services. There is usually much more capacity available than actual use made of these detox. options and support services. It may be a very naive question, but I would like to know if there is a detox clinic in Alice Springs? We have a highly trained and well paid police force operating in the NT. And what do we ask them to do? We ask them to babysit cranky, sloppy drunks, drunks who are often so far gone in their alcoholic stupors that they foul themselves as they stumble down the street. What those taken into protective custody make of the holding cells doesn’t bear thinking about. And when a member of the police in a once-in-a-blue-moon moment turns his or her back in disgust, and someone dies from alcoholic poisoning while in custody, we turn on the police instead of addressing our own failure. No one chases death in a bottle in isolation. No one gets to the point that they can return a blood alcohol level seven times the legal limit without prior form. And if the families and the peer groups and the community at large cannot prevent the slow suicide of chronic alcoholism, it is unrealistic and escapist to blame the police when the inevitable happens. Yes, hold the police to account and insist that they accept responsibility for their actions and inactions. But equally, hold the public to account and insist that they also accept responsibility for their actions and inaction. To do any less is simply dishonest. We are all responsible for Kumanji Briscoe’s death. @n Another of our FIRST AUSTRALIANS has “died in custody” and it appears that no-one will be held accountable for this human being’s death. Aboriginal deaths in custody will continue until someone has the balls to stand up and say “no more”! The Mulrunji Doomadgee death in custody here in Townsville showed the world how racist the Queensland coppers could be. Copper Chris Hurley walked free, obtained a massive payout AND was promoted! What’s that telling ya? Kill an Aborigine, walk free, no penalty! Makes me wonder if RACISM against Aborigines manifests in each state and the coppers perpetuate the situation. RIP Mr. Briscoe. You never received JUSTICE in this life … hope you receive it in your next life. Fred (Posted June 28, 2012 at 11.27am): Although you are quite correct in demanding greater degrees of personal responsibility by problem drinkers and their associates, you have got your facts wrong: the Coroner has only heard evidence, testimony by witnesses, and arguments by counsel, and now gone away to write his report. You must be getting the Coroner confused with statements by other parties. A number of police admitted blame for a long list of failures and disobeying instructions, so it is hardly surprising that they are receiving at least some of the blame. As they admitted in court, the difficulty of their jobs is no excuse for some of the things they did, such as treating the detainee in ways that they had promised, following a previous inquest, would not be repeated; not training staff adequately; not staffing the Watch House adequately; not supervising junior staff adequately; not checking regularly on the detainee; and ignoring the alarms being raised by other witnesses. When police arrest a person, they have a duty of care for the person. It is quite probable that, if Briscoe had sculled 350ml of rum and gotten into similar physical trouble at the Flynn Drive park, his mates would have called for appropriate help, as they tried to do in the Watch House. Further, the police themselves have admitted that they need more staff and better systems to deal with these matters properly, with less risk to themselves and their prisoners. Hal, Briscoe was an orphan. I know his aunties and grandmothers very well, have done so for 30 years or more. You could not get better, more responsible people. They tried their best. They have nothing of which to be ashamed. The deceased was not a bad person. He slid into alcohol dependency despite the best efforts of his family. This is a measure of the immense power of local peer group pressure, especially amongst the largely unemployed male drinking circles, where initiated men pressure each other to join in the drinking, and quickly become dependent, then addicted. It is in the interests of the addicted to recruit more participants, and maintain their presence, thus ensuring they go on contributing to the shared kitty of cyclical, unconditional welfare funds which enables the virtually non-stop drinking by some. The family has every right to sue, if that is their wish. I believe that they should be left to make this decision in private, without external pressure. I agree with you other comments: it does boggle the mind that there can be a politician on either a local or Territory level not advocating for at least one day a week with no take-away grog sales, and a floor price. The police in court by their frankness earned a lot of respect and support, and it goes without saying must go on performing their most difficult work. Hal Duel is right about the responsibility of the police, if they take someone into custody they have a clear duty of care. Especially as the man could not exercise personal responsibility, given his condition. As for the family, that’s a tough issue, a family, even with the best will in the world, may not be able to keep an adult on the rails and safe. Hal’s suggestion of a grog free day is a step in the right direction, but I think a far better solution would be to set an appropriate floor price on alcohol here in Central Australia. That is more likely to achieve a reduction in consumption. The NT Police Association is clearly jack of the current situation and the position it puts their members in … and rightly so. And in the Australian this week we had Pastor Basil drawing our attention to the huge bottle shops sales here in the Alice. We apparently have two of the three biggest outlets in Australia! No wonder it is carnage. The Police Association say we have inadequate liquor restrictions. That is because of Govt failure to stand up to the liquor industry. Gutless Government? NT Labor might actually win an Alice Springs seat in the NT Parliament if they did something constructive. I will ignore “Fred”, and others of his ilk, until he has the courage of his opinions to put his name to them. Some general community discussion around the Coroner’s report pertaining to this issue asks why the police are being blamed at all? It wasn’t the police, system or general community to got themselves in a state endangering Mr Briscoe’s life. It was himself and those who also were involved in the hours leading up to police arrest. The coroner has basically said that the Australian taxpayer now needs to fund more staffing, systems and resources because everyone except the person/s involved are responsible! For what! To make those in society who blame everyone else for individuals’ actions feel better. If I walk to the edge of a bridge (drunk or sober) and leap off to my death or serious injury, is it the fault of the community? Of course not! Nothing, no-one, including the law can prevent this because it is my choice, my decision and my actions. One man died while in police custody, and while drunk to the extent of being 7 (?) times over the legal limit. In this specific case, two parties share responsibility: The NT Police and the man’s family. 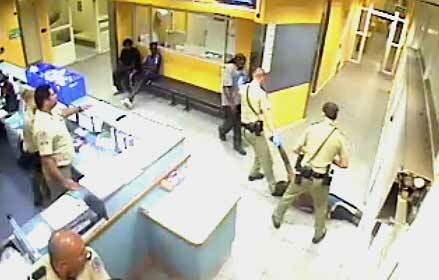 The first because on the night a man died, he was in custody and under the care of the police. There’s no getting around that responsibility. The second because for 32 years (I’ve also read 27), the deceased was under the care of his family, and somehow his life was allowed to deteriorate to the point where he drank himself to death. There is no getting around that responsibility, either. Away from the specifics of this tragedy, two points stand out. There can be no doubt that the NT Police deserve the highest commendation for professional restraint in the face of constant alcohol-fuelled aggression. The wonder is not that this happened, but that it doesn’t happen regularly. Also, it boggles the mind that there can be a politician on either a local or Territory level not advocating for at least one day a week with no take-away grog sales. I hope the bereaved family does not sue the NT Police. If they do, I wonder how the police would fare lodging a countersuit naming the family as equally responsible. I also hope there is an immediate and independent inquiry into alcohol sales and restrictions in the NT. Without turning down the tap we are asking the impossible of the police. But until that happens, let the police maintain their presence around the alcohol outlets in Alice Springs and continue to patrol known drinking spots. Let them continue to tip out illegally held grog and continue to take off the streets those who threaten safe urban life. And let us continue to support and respect the NT Police. Can you imagine life in Alice without them?